Office. In the second half of 2007 the size of the office supply in Sofia continued its upward trend from the past few years and registered 16% growth compared to the middle of the year, adding about 98,000 m2 of office space, according to the latest Colliers research, the H1 2008 Office Market Overview. Currently, the total inventory of multi-tenant and speculative Class A and B office space in the capital stands at 704,600 m2. New supply in the second half of 2007 was mostly driven by suburban development, delivering 66% (or 64,000 m2) of the total new office space. The office market in Sofia remains supply-driven. The existing office inventory is almost fully occupied and the new supply seems insufficient to meet the current market needs. Vacant space declined during the past six months, accounting to less than 4% (or 26,000 m2) of the total office supply. Net absorption was 161,000 m2 in 2007, exceeding expectations and up from 101,500 m2 in 2006 – 58% growth. Rent levels continued to grow in the second half of 2007. The increase was most notable for Class A properties for which asking rents went up in all submarkets, reaching an average level of over €15/m2/month. In the CBD, rents kept the trend from the past years, growing at a rather slow but steady pace, and averaging €17/m2/month for available office space. The highest annual increase in asking rents for class A was in Broad Center - 22%. Retail. In terms of modern retail, Bulgaria is still relatively under-supplied with an average shopping mall ratio of 15 m2/1,000 capita. However, the segment is growing fast; in the second half of 2007 seven new shopping malls broke ground. 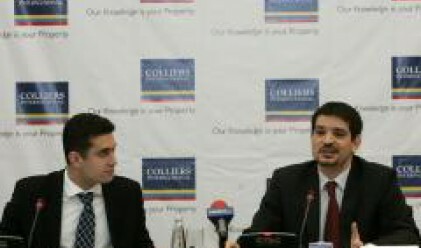 Scheduled deliveries are expected to increase the retail inventory in Bulgaria with more than 100% in 2008, shows Colliers H1 2008 Retail Market Overview. The mid-term (2008-2010) pipeline of projects is also significant with second-tier towns catching up with the major cities. High street locations continue to enjoy high demand and retain past rental levels between €50-130/m2/month in Sofia. No significant changes are registered in shopping mall rents, and they command ranges of €30-60/m2/month. Nevertheless, inferior shopping mall schemes are expected to experience difficulties achieving full occupancy at those levels. Logistic and Industrial. By the end of 2007 the total inventory of contemporary logistics and industrial large-size projects in Sofia and the region accounted for about 1,200,000 m2, with only 165,000 m2 of speculative space. Stock remained basically unchanged in the second half of 2007, and a total of app. 70,000 m2 is currently under construction (of which only 22,500 m2 is speculative) to be delivered in the first half of 2008. Outside of the capital, this segment is gaining momentum in the city of Plovdiv, where the contemporary inventory of owner-occupied and speculative industrial space increased in the past 6 months, accounting to about 600,000 m2. On the Black Sea Coast, the Varna market currently comprises about 300,000 m2, with no major changes in the second half of 2007. Bourgas still lags behind with existing contemporary inventory of 102,000 m2; however, the city has significant potential for development. Prime rents for industrial space in the country remained at the levels from the first half of 2007 at €3.8 – 5.5/m2/month, and are expected to remain stable throughout H1 2008.